After a few days with the Slow Fishers tribe, the other tribes started feeling restless. Exploring was in their blood and could not be denied for long. Heena and her sister Dees had spent the days together, catching up and recounting yet again their old adventures. They decided their two tribes should travel together for a bit. Heena would show wise Bralla where the sacred places were so she could remember them for her maps. 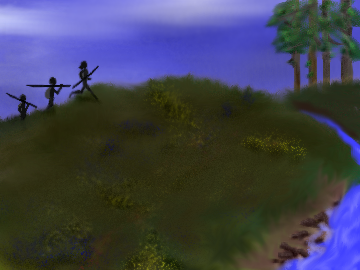 Dees’ tribe would show the others around some of the newer areas they had explored. “I worry about Saska,” Heena admitted with a frown. An uneasy silence fell between them, guarding them from going too close to the uncomfortable topics the both preferred to avoid. They continued for the rest of the day in silence. Near sunset, the two tribes stopped, set up camp, and shared a simple meal of dried fish and water. “I’m sorry about before,” Dees said, finally breaking the silence between the two sisters. “I still worry, though,” Heena said, her voice trembling. “Because you are a good mother.” Dees embraced her sister. They sat together watching the sun set, then they went off to find their places for the night. The next morning it was decided that they would run to the sacred place. Everyone gathered up their pack and set off in a long line. Heena lead the procession, following her senses and her memories of where the sacred places are. The fast pace meant that they would not be able to talk, so Heena had to choose a clear path and decide when to take breaks. She pushed the group far and fast, stopping after a while to make sure that all were okay. The sacred place was still a distance away, but they could cover that easily after a break. “Heena,” the older voice came as Heena was leaning against a tree and drawing some strength. She looked up to see Bralla approach. “He rests now,” Bralla said with an edge sadness in her voice. “I miss him,” she admitted with a sorrowful sigh. Heena laid a hand on Bralla’s shoulder. “I remember all the sacred places. They are important,” she said solemnly. “You do it well. Nobody can replace you,” Heena said while smiling at the older woman. “Not for a long time, I hope!” Heena said. She was a bit taken aback by Bralla’s attitude; did losing Moun turn her thoughts so dark? Bralla just nodded quietly and appeared to be lost in her own thoughts. After the break, the group picked up their packs again to get ready for another bout of running. The sun was reaching the top of the sky by the time they stopped near a small cairn of stones near a copse of thin trees. Heena sat down her pack at her feet and breathed deeply. She could feel the sacred area, the energies flowing all around. “We are here,” she announced. Many were already sitting down and catching their breath. “Yes, that is the marker. I wish you could feel the essence of this place.” Heena inhaled deeply, the energy nearly intoxicating her. Prin looked away bashfully, then said a quiet goodbye to Heena. She went to talk to Bralla and the two women, one old and one so very young, talked and pointed out different landmarks they could see from the area. Heena watch them for a moment, then closed her eyes and lost herself as the sacred place washed over her once again.